Although nominally participating in the international coalition fighting the Islamic State, President Recep Tayyip Erdogan has covertly aided its advance. 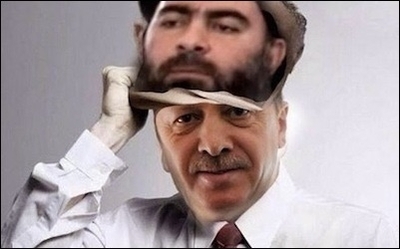 In theory, Turkey is part of the international coalition that fights the Islamic State (IS). Since it joined the fight last year, it has arrested scores of IS militants, made some efforts to seal its porous border with Syria and tagged IS as a terrorist organization. Turkish police have raided homes of suspected IS operatives. More recently, Turkey's Interior Ministry updated its list of "wanted terrorists" to include 23 IS militants, and offered rewards of more than 42 million Turkish liras (more than $14 million) for any information leading to the suspects' capture. But this is only part of the story. engaged in the activities of the terrorist organization called DAESH [Arabic acronym of IS]. The suspects had sent persons to the conflict zones; they applied pressure, force, violence and threats by using the name of the terrorist organization, and they had provided members and logistic support for the group. The Turkish government relies on Islamist grassroots supporters of various flavors. Key IS suspects have been freed to appease the government's Islamist supporters. In order to pass through the border controls unimpeded, effectively with the complicity of the Turkish authorities, products are processed for companies that are purportedly registered in Jordan and Iraq ... Registration and processing of the cargo are organized at customs posts in the [Turkish] cities of Antalya, Gaziantep and Mersin. Once the necessary procedures have been carried out, the goods pass unhindered through the border crossings at Cilvegozu and Oncupinar. Infidels who were enemies of Islam thought they buried Islam in the depths of history when they abolished the caliphate on March 3, 1924 ... We are hopeful, enthusiastic and happy. Some 92 years after ... we are shouting out that we will re-establish the caliphate, here, right next to the parliament. 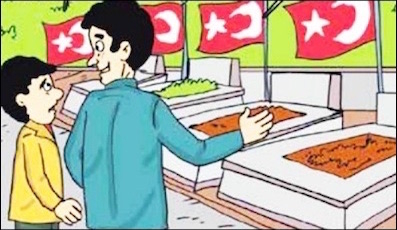 Turkey's official religious authority recently issued comic books to the nation's children telling them how marvelous it is to become an Islamic martyr. Guess what else Turkey is doing while pretending to be fighting jihadists? Apparently, President Recep Tayyip Erdogan's declared political ambition to "raise devout generations" seems to have geared up. Turkey's Religious Affairs General Directorate (Diyanet), the ultimate official religious authority in the country, recently issued comic books to the nation's children telling them how marvelous it is to become an Islamic martyr.